Gas Line Repair Napa, CA | A+ Waterworks, Inc.
Knowing who to go to for gas line repair in Napa, CA is important in every household. They keep your stove, fireplace, water heater, and other gas-powered appliances in working order. When these appliances do not get a steady supply of gas because of a pipeline problem, a professional gas line repair in Napa, CA is in order. At A+ Waterworks, we are dedicated to our craft and clients’ satisfaction. If you need help with a gas line repair in Napa, CA, you can expect us to deliver results that are nothing less than exceptional. Besides keeping appliances from functioning well, damaged pipelines can pose a threat to your health. That’s why you need to schedule a professional gas line repair in Napa, CA at the first hint of a gas line issue. Below are a few ways to learn whether you need a pipeline repair in Napa, CA. Learn if you need a gas line repair in Napa, CA by checking your surroundings. If you suspect a leak, check your surroundings. Is the vegetation near your gas lines dying or dead? A leak may be occurring, which calls for a gas line repair in Napa, CA. For your safety, contact a professional to do a gas line repair in Napa, CA for you. We are known for providing A+ pipeline repair in Napa, CA and meeting the expectations of our clients. If you find yourself faced with a pipeline issue, let us handle the necessary gas line repair in Napa, CA. Learn if you need a gas line repair in Napa, CA by assessing your condition. Besides your surroundings, you can assess your health to see if you need a gas line repair in Napa, CA. Have you been feeling nauseated lately while inside your home? It’s possible your pipeline is leaking. For your safety, it’s best to let professionals perform a pipeline repair in Napa, CA. Our specialists at A+ Waterworks are experienced in gas lines. When you choose us to perform a gas line repair in Napa, CA, expect us to do A+ work. Learn if you need a gas line repair in Napa, CA by checking your gas bill. Another possible indication that you need a gas line repair in Napa, CA is a sudden spike in your gas bill. When the appliances hooked to your gas lines are malfunctioning, they may consume more gas than necessary. To save yourself from unnecessary costs and stress, consider a gas line repair in Napa, CA done by professionals. A+ Waterworks performs an excellent gas line repair in Napa, CA at a reasonable rate. If you need a gas line repair in Napa, CA, we are the company to call. Learn if you need a gas line repair in Napa, CA by evaluating your appliances. A+ Waterworks will determine the cause of the problem and address it through a comprehensive gas line repair in Napa, CA. At A+ Waterworks, we prioritize not only the satisfaction but also the safety of our clients. We can perform a gas line repair in Napa, CA that will be beneficial to you in the long run. Your damaged gas lines require immediate attention. To prevent your pipeline problem from worsening, let us perform the necessary gas line repair in Napa, CA. You never have to settle for subpar repair services by hiring our licensed workers. At A+ Waterworks, we go the extra mile to offer superior gas line repair in Napa, CA. Contact us if you need a gas line repair in Napa, CA. Drains will clog over time. The accumulation of soap, hair, grease, and dirt builds up on the walls of the pipes, causing plumbing blockages in kitchens, bathrooms, and sinks, among other areas. Blocked drains are inconvenient, unsanitary, and simply disgusting. Not only do they emit an intolerable odor, but they may also cause potential harm to your family once drain pipes break. When regular drain cleaning is not enough to solve the problem, turn to A+ Waterworks! 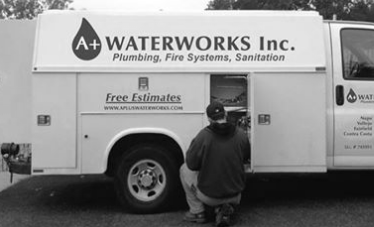 The A+ Waterworks team has decades of industry experience in residential and commercial plumbing cleaning. Our sanitation experts will do everything to determine the cause of the blockages. From there, we’ll use the information we get to plan and implement actions that prevent these blocks from happening again. Efficient service includes plumbing, drainage, and fire prevention systems are very important in securing your property. Whether you’re a humble owner of a small house or a proud entrepreneur running a large factory, these systems are indispensible. As such, it would be very beneficial to learn updated facts about them. For more information about proper plumbing, fire prevention, and drainage, visit our resources page. Our office hours are from 8:30 A.M. to 5:00 P.M., but emergency service are available 24/7. You can easily call us at 707-255-6150, or drop by our office located at 194 Camino Oruga, Ste. 13, Napa, CA. Similarly, you can send us an email at [email protected] or by using the inquiry form located on our contact page. Visit our website for more information about our services. We look forward to hearing from you!